Make a statement with these rich pink Asiatic lilies, arranged in a small gift box with creative flair. 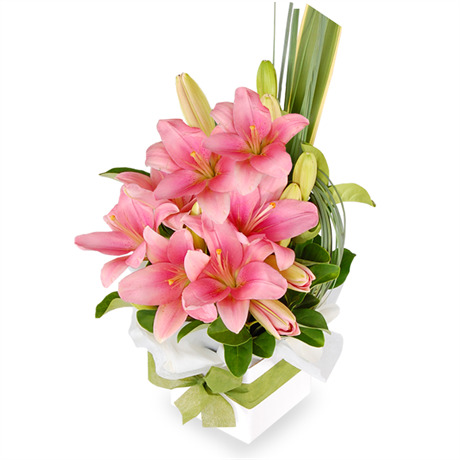 Effortlessly elegant and feminine, this arrangement would make a gorgeous gift for the person who appreciates the tropical sway of lilies, or the colour pink. With the low maintenance and practicality of a gift box, these blooms do not need to be rearranged in a vase, and as they do not emit fragrance, would be appropriate as a ‘get well’ present. The softness of the Katie makes it a gorgeously feminine gift, and is always met with appreciation.